This week's Baking with Julia involved lots of summer fruits and berries - which can be a challenge when you are based in the opposite hemisphere and it is winter. Today was rather windy and wet and cold, which is a pretty awful combination. This pie was delicious. I had no problems with the filling being runny, and the crust was suitably flaky. To see what the other BWJ bakers thought of this pie, visit the LYL section of the BWJ website. I started blogging after being a lurker for two years. 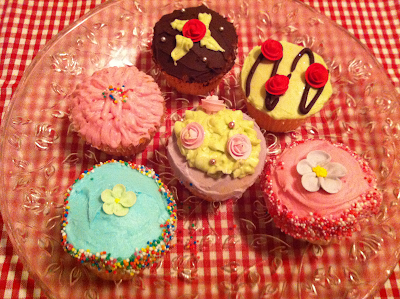 I found blogs through an article in The Age on cupcake blogs, and that took me on the full blogging journey. In the beginning, I thought that I couldn't write a blog as I wasn't qualified and no-one would read it. Wrong on both counts really - all you need for your own blog is a passion and a voice, and although the readership was rather slow (I talked to myself for about 7 months), it did eventually take off. Now, I actually like going back to my old posts for my own interest. I am going to pass these awards on to Kathy of Bake Away with Me and Chunklet of Yummy Chunklet, two bloggers whom I met through French Fridays with Dorie. Go check them out - they have fun blogs. Yesterday was a bitter, cold, wet day in Melbourne. The sun only feebly made an appearance a couple of times, and even when it did, the warmth was minimal. It was however a good day for baking - an activity which allows you to stay inside, be busy, and warm up the house. It looks like an exotic gemstone, and to me, tastes like heaven. I adored this tart and would make it again in a heartbeat. I am a Turkish Delight and Mad Men fan, just like the author of this recipe, although the sound of her Turkish Delight sandwich makes me queasy. All I can say is skip the "sandwich" and make the tart - I think you'll love it. Do you ever buy ingredients for one thing and they end up hanging around forever? That was the case with me and my jar of Nutella - I bought it for a Dorie recipe, and months later, it was still in the pantry cupboard, staring at me accusingly. However, there was a feature in the newspaper on tea loaves this week, sourced from various blogs, and lo and behold, what did I spy but Nutella Banana Bread - perfect! Something that sounded delicious that I could use up my Nutella making, and practical enough to transport to work without a hitch. The recipe for the Nutella Banana Bread comes from Chef in Training - you can find it here. Accordingly, if chocolate and banana float your boat, or you just want to use up your Nutella, like me, you could do much worse than give this bread a go. Two different crackers recipes had to be prepared using two different methods of forming. Both recipes were supplied by our host. 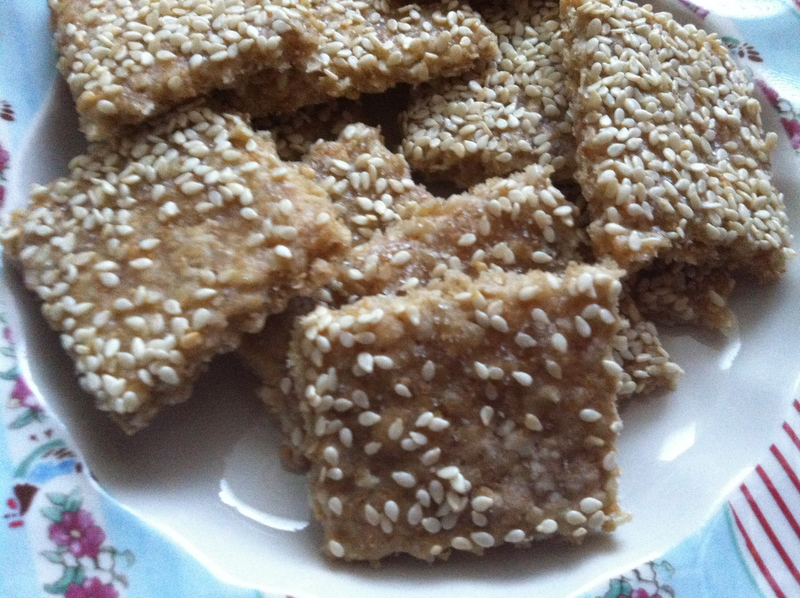 My favourite was the Health Crackers - they were crispy and salty without being overwhelming. They were also easy to make. For the cheddar crackers, I used a crumbly cheddar, Cracker Barrel Aged Vintage, and I am wondering if this was why I ended up with tasty but crumbly cookies. To see what the other Daring Bakers came up with this month, visit the slide show at the Daring Kitchen website. It's Friday again, and that means French Fridays with Dorie. This week's recipe, to close out July, is Lemon Barley Pilaf. I have never cooked with barley before, so this was a new experience for me. I really liked this tasty side dish, which I served with last week's salmon. It is a colourful alternative to rice or mashed potato, and has a lovely nutty quality. 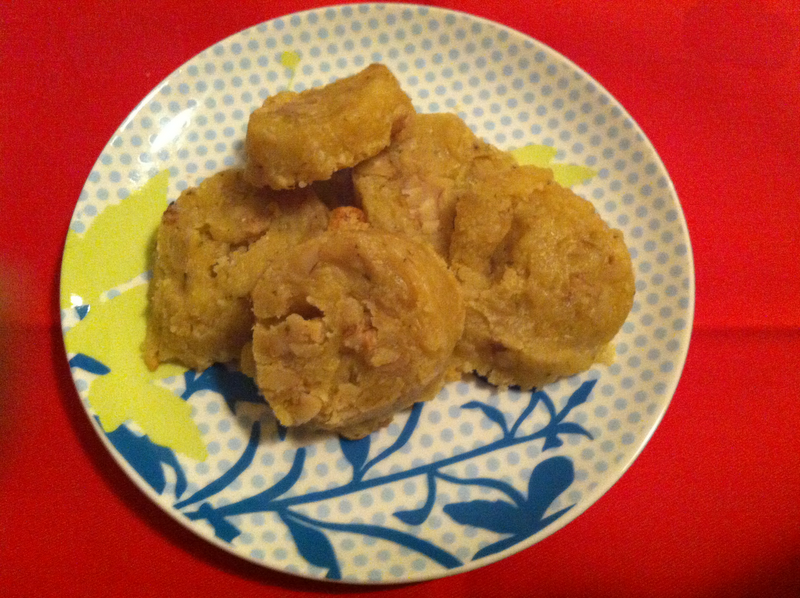 To see what the other Doristas thought of this dish, visit the LYL section of the website when it comes up. Sometimes, unexpected gems open up right under your nose. There has been a bit of movement in the shops and restaurants in my suburb lately, and one of the best finds that I made is Vanilla Omelette, an unlikely-monikered Thai restaurant in Malvern. Vanilla Omelette is tucked in near to Malvern train station, just before you hit Glenferrie Road. For this reason, it is out of sight of the main traffic in Glenferrie Road, but it is definitely a treasure worth turning off for. Tim and I decided to try Vanilla Omelette for Sunday lunch, just on spec, and we were not sorry. The restaurant is kitted out in dark furniture, but remains light and airy, and provided a welcome reprieve from the wet, cold weather outside. These crispy rolls came with a sweet chilli dipping sauce. 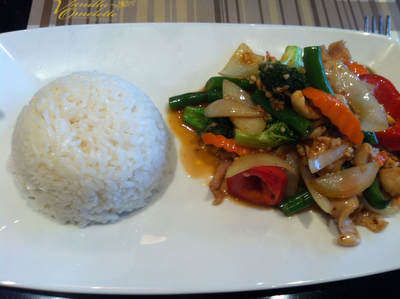 Both meals were atractively plated with steamed rice, and tasted as fresh an delicious as they look. Vanilla Omelette offers a full range of alcoholic and non-alcoholic beverages to enjoy with your meal. The service was friendly and efficient, and if you are minded to do so, there are news papers and magazines to read while you are waiting. Vanilla Omelette is a terrific new Thai restaurant in my local area, and I hope that it does well so that I can continue to enjoy eating there. This week's French Fridays with Dorie challenge was Salmon with Basil Tapenade. I don't often cook salmon, not because I don't like it, but because it is soooo expensive. This piece of Tasmanian salmon cost me $9 - about the same price as I would normally pay for meat for the week. However, I am a Dorie disciple, so for this week, I took the hit. To see what the other FFwD cooks thought, visit the LYL section of the website. 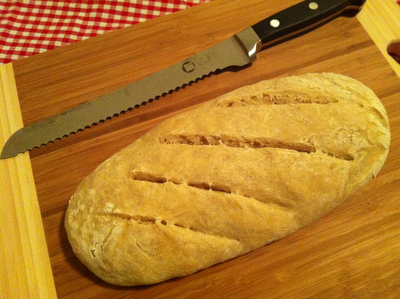 This week's Baking with Julia challenge transports us to Italy to make rustic Semolina Bread. Our hosts are Renee of The Way to My Family's Heart and Anna of Keep It Luce. The texture of the bread was coarser than bread made with plain flour because of the semolina, but still tasty. To see how the other BWJ bakers fared, visit the LYL section of the website. How was your weekend? Mine was quite busy - I need another weekend to recover from this one. Last night, I went to see the fourth most popular folk group in New Zealand, Flight of the Conchords. Many of you will be acquainted with them through their BBC radio series or their HBO TV show. The Conchords are just as hilarious live, and showed their ad lib prowess on stage in response to audience heckling. My favourite response was when someone asked them to perform a song that was not on the program - quick as a flash, Jemaine drawled back, "We're not very good at that one." It was a great show, with Arj Barker supporting the Conchords. The grand finale was Sugalumps - and once again demonstrated why you should never sit in the front row at a comedy show. On Saturday, I did yet another cake decorating course. This was not planned - I got a call on Friday asking would I like to do Whimsical Cakehouse's Foundation I Cake Decorating class (1 tier round cake) the next day, as they had a vacancy. On the spot, I said yes, though I should be a little more cautious before opening my mouth - I realised that I had just committed my entire Saturday, as the class runs from 10am to 5pm. It was definitely a terrific class, and I learned a lot. I may not have executed everything perfectly, but that's the point, I think - so that I can have a go and learn from my mistakes. We decorated a chocolate mud cake, cut it into three layers, filled the layers with ganache, ganached the outisde of the cake, then iced it in fondant, placed it on a board we'd covered in fondant, then decorated the cake with sugar flowers that we had made out of coloured fondant. I rolled my fondant too thin so I have a couple of imperfections in the icing, but no matter - I am very happy with the end product. Our teacher, Mignon, was excellent, and showed us how to rescue our mistakes. I would definitely recommend this course to anyone who has a passion for cake decorating. It's dessert time for French Friday with Dorie, and the recipe was Blueberry Marscapone Roulade. 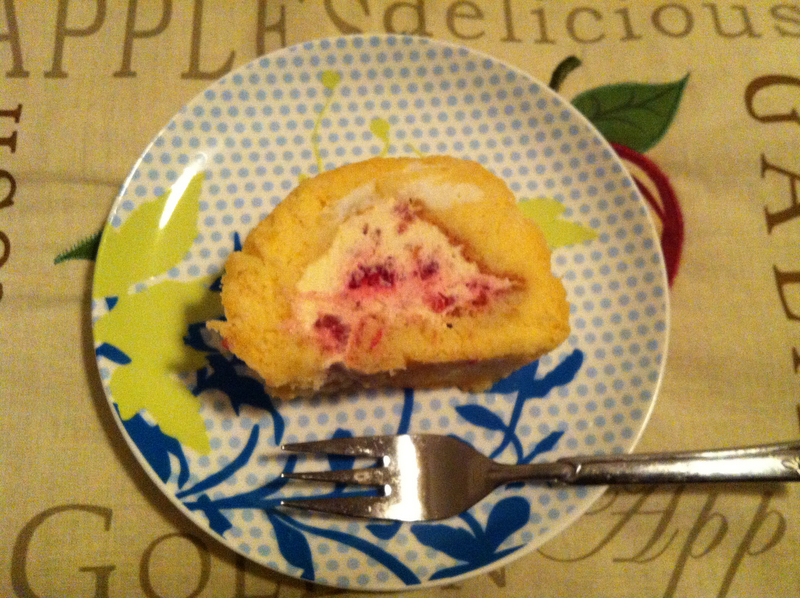 To be different, I made Raspberry Marscapone Roulade. This was simple enough to make, if a little fussy. I managed to get icing sugar everywhere at one stage, making a sticky mess. This meringue, cream and berry concoction was quite delicious. There's not much else to say. However, to see what the other Doristas have to say, visit the LYL section of the FFwD website. Last Friday, I had to deliver the Legal component of the Sales team training. At dinner the night before, I learned that the products and marketing team had handed out chocolates in their session. Accordingly, I had a lot to live up to. To uphold the honour of the Legal team, I decided to make muffins to hand out, primarily because they are quick and easy. I flicked through Leila Lindholm's A Piece of Cake, and my eye was caught by a recipe for Blueberry Corn Muffins. They sounded tasty, I had all the ingredients and they were easy to make - I was sold. The soft, sweet berries contrasted with the slight grittiness of the corn. Preheat your oven to 220 degrees Celsius and line a 12 hole muffin tin with muffin papers. Melt the butter, then add it to a bowl with the eggs and buttermilk, and beat well with a fork or whisk. In a separate bowl, mix together the flour, cornmeal, sugar, baking powder and salt. Add the dry ingredients to the wet ingredients and fold together until well combined. Shake the blueberries and plain flour together in a plastic bag to coat the berries, then fold through the muffin mixture. Scoop the muffin batter into the papers, filling them approximately 2/3 full. Place the muffins into the preheated oven and bake for 20 minutes or until cooked through. Unmould the muffins onto a wire rack immediately on removing them from the oven. Just like the recession we had to have, pictured above are the cupcakes I had to have, given the circumstances I found myself in. My colleague Susie kindly gave me her voucher to attend a cupcake decorating course run by Jennifer Graham of Crabapple Cupcakes last night, as she could not attend. The course started ordinarily enough, although rather more politically than most, as Jennifer has some very strong beliefs about the cupcake industry that she shared with the class. However, by the end, the course had disintegrated into something akin to a Boxing Day sale in a mad grab for icing, piping bags, edible glitter, cachous and flowers. Jennifer's course teaches techniques for decorating cakes using buttercream and ready made sugar decorations. 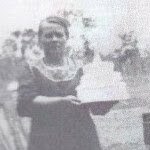 Her cakes are undeniably pretty and taste very good, and I have often professed my admiration for her recipes for Very Vanilla and Dinosaur Rock Chocolate Cakes fom the Crabapple Cupcake Bakery Cookbook, which are my basic cake recipes of choice. She does have some very good tips for how to hold cupcakes, knives and piping bags while decorating, which differ in some respects from the more conventional wisdom that was espoused to me at other cupcake decorating classes. However, the key course disadvantage is that Jennifer shows you all the techniques before letting the class loose to decorate their own, which means that some things are easily forgotten before you get a chance to practise them. Apart from the aforementioned grab for supplies, other drawbacks included the small size of the room (on the first floor of a city restaurant) for the number of students, and an absence of damp cloths or a readily accessible sink to clean your hands and utensils of excess frosting, sprinkles and other detritus between cupcakes, leading to cross-pollination of cake decorations and a messy benchtop. In the end, I used whatever supplies were easiest to access and used my apron as a cleaning cloth to wipe my hands. My cupcakes are decorated with (clockwise from top) chocolate ganache, "the proposal" buttercream and ganache design, a woeful attempt at the "signature swirl" design, a freeform swirl, a chrysanthemum and a topiary design. 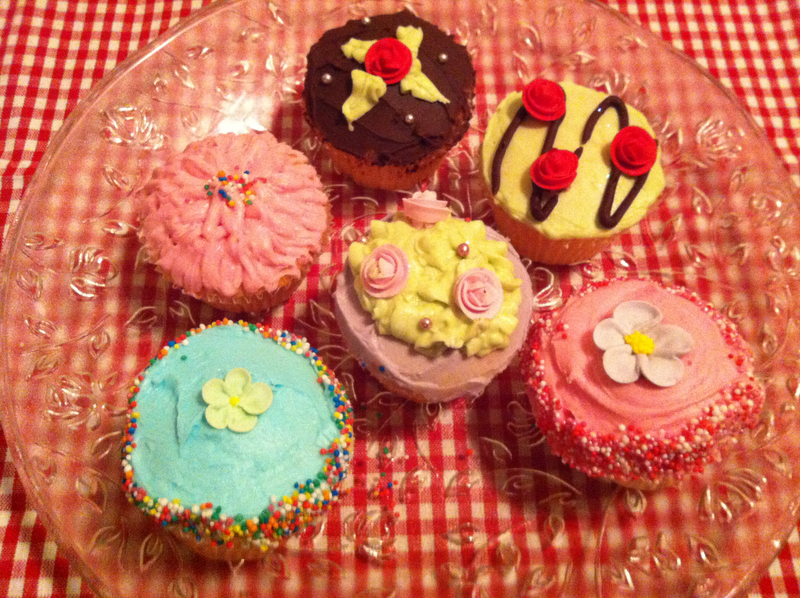 There were other designs demonstrated to us, but we only had six cupcakes, and I wouldn't have wanted to attempt any more in the class. I have taken notes and I bought a basic piping kit that included all the tips Jennifer used so that I can go away and practise Jennifer's designs in the peace and sanity of my own kitchen. I have a milestone birthday coming up soon and I plan to make cupcakes; however, I will be going with one of the elegant and simple Whimsical Cakehouse designs atop Jennifer's Very Vanilla cupcake recipe rather than a buttercream swirl. I enjoy cakes with colour and texture as well as flavour, and last week, I made a cake that fitted that bill completely. The cake was the Lemon Polenta Cake from the Manna from Heaven cookbook. This cake contains lemon zest and coconut and should contain polenta. However, I accidently used semolina instead of polenta, which meant my cake was not gluten free. However, Linda at work said in her view, this made the cake nicer, and reminded her of a cake she'd had in India. It was so good, she asked for the recipe. My only tip is to be sure to line the bottom and sides of your pan, as the cake has a tendency to stick. Verdict: a textural, tangy delight. This post is about my favourite day in Los Angeles, spent at the LA Farmers Market. However, as I write it, I am very annoyed, as Blogger, in its "wisdom", has rearranged the order of the photos that I uploaded a few days ago. I have rearranged some of them, but the rest are now all over the place, and in no particular order, because Blogger deemed it to be so, just like it insists on rotating my photos the wrong way, no matter how I take them. 'Nuff said. The LA Farmers Market is on Third Street and Fairfax Avenue, West Hollywood. It was started in 1934 by the Gilmore family, and today is an enormous, bustling marketplace filled with food shops and eateries, and adjoins the massive Grove shopping complex. There are also souvenir shops and even an antique toy shop. I bought some gorgeous coasters featuring old chocolate advertising, and was sorely tempted by a wattle tablecloth. Yes, this was the meal without any extras, and yes it was enormous - it only cost $10.50, but there was no way I could manage more than half of it. I really needed to bring a friend so we could split it. Although it was enormous, the meal was delicious - I am a fan of beans, and the sweet potato salad was very different to anything I have tried before (in a good way). I didn't eat the cornbread at all - it was as dry as dust. Perhaps it is meant to be eaten by soaking up the sauces of your meal to give it moisture, but I was not going there. I then spent some happy hours shopping at The Grove next to the market - it was amazing - before stopping off at my favourite grocer, Trader Joes, on the way home. If you find yourself in Los Angeles and are into food, do not miss the LA Farmers Market - it is amazing.